Now, don't get me wrong. I'm certainly not complaining about the mild weather we've had this summer. But with only two days until Charlotte goes back to school, it was nice to have a day warm enough that a dip in the in-law's pool actually felt like a summertime swim. And then, after a restful afternoon, and with dinner on the grill, it happened. Every boy dreams of growing up to be a professional baseball player. What a great feeling that would be to get the call saying you've been called up to the big leagues! Okay, actually I got a text. 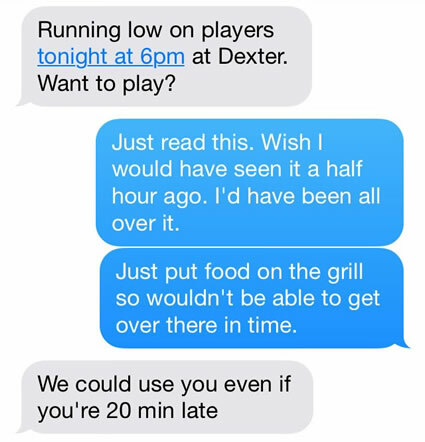 A text to fill in for a church league softball game where they were short on players and didn't want to forfeit. It was like it was straight from a movie script. Just like I'd always dreamed it would happen. It'd been a few years since I've played softball -- I could tell by the fact that the electrical tape which held my cleats together three or four years ago had to be replaced before I could head to the field. Forty minutes and a sore hamstring later, my comeback was complete. My boyhood dream had come true. Now I just need to find a way to be a stunt man on the Dukes of Hazzard set. The Summer of Tim continues. Tim, you neglected to regale your readers with the inspiration of the grizzled veteran amongst a ragtag group of players facing a 7-0 deficit, your no-hitter-ending single, and your inspiring defense. Don't deprive your fans of the rest of the story! Oh, Henry. I think you could have easily stopped after "grizzled." They start school in July? Yeah, Rich. On a balanced calendar (year-round school).